These custom-tailored portable restroom facilities cleverly work to find the balance between privacy and luxury while also providing a truly unique bathroom experience. 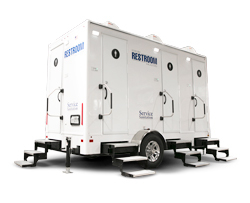 With several interior styles to choose from, these self-contained restroom trailers have quickly become a #1 choice for small to mid-sized events where luxurious indulgences are preferred. Bringing all of the comforts and privacy of a home restroom, the Regal 2 luxury restroom trailer is the preferred choice among the elite. 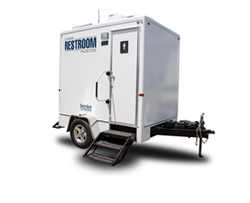 This trailer was designed to accommodate guests comfortably while also providing them with an elite restroom experience. Designed to accommodate mid-sized crowds, the Regal 4 has become a preferred rental choice for weddings, concerts and more. 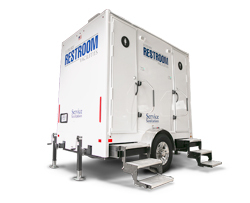 Classy and embellished with luxury, the Regal S2 trailer can accommodate your guest’s needs, providing them a 5-star restroom experience. With a modern, stylish design and elegant finishes, the Regal S4’s upscale environment provides relief to your guests with utmost luxury.